Second to come after the first of Shark came to our rider was this, the Shark Speed-R. A road going top of the line helmet from Shark. It came in 2014 with the aim to further protect the head of our test rider and gives the show a better visual presentation in terms of head gear. Collaboration between Shark and Malaysian Riders continues with the helmet being the officially used by our rider for his activity on and off the show. 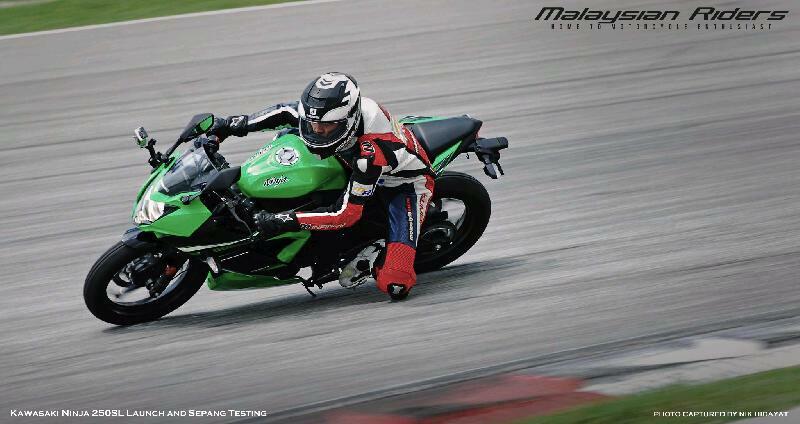 In late 2013, during Shark helmets’ private media presentation; all the media members were given the info regarding the level of products that will be available for the brand here in Malaysia and one of it was the Speed-R. Our rider was greatly impressed and happy with the quality of the helmet and was thankful that he was wearing one during his biggest crash in 2014. First thing first, the Speed-R is a modern looking helmet that compliments the modern design of motorcycles nowadays. Not that other manufacturers of helmets out there are being left behind in this segment, but it is just a cool thing to say coming from a pretty much young helmet manufacturer based in Marseille, France. 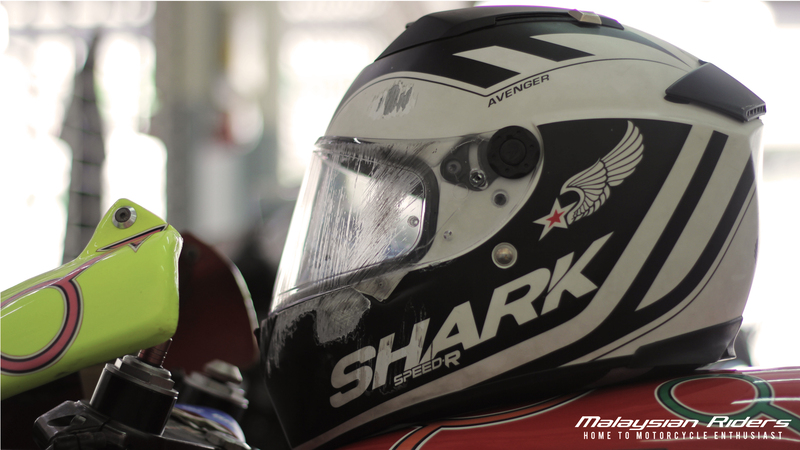 The one that our rider received from Winmaster Sdn Bhd; the sole distributor of Shark Helmets in Malaysia was the Avengers. A white and black designed helmet with a pretty graphic on the main area on the left and on the right. It may be suitable to those younger sets of riders who are looking at helmets that has the clean yet stylish design in expressing themselves while they are riding. One thing for sure, the Shark logo on the forehead and typography on the sides really stands out for the onlookers. This give the wearer a certain feel of pride while using the helmet. An obvious thing to say about the helmet once our rider put it on his head was that he straight away feels that the helmet are being made with a high quality materials for the inner padding and foams. The Speed R was actually made to cater the touring segment of motorcyclist and thus it has a much comfortable hold from it’s padding inside. Our rider was on a medium sized helmet and it grips our rider’s head firmly yet it still feels comfortable enough for a long ride or a long usage of the helmet. This truly gives the wearer a better experience in riding plus you can focus more on your actual riding rather than thinking about your head comfyness. The shell (outer) made by Shark seems neat and well assembled; this shows from day 1 of our rider’s unit up until the last day of the helmet’s life when he crashed in Sepang circuit. Now this is the main talking point for the Speed-R helmet. Like what we state above, the Speed R helmet was mainly made for those who like to ride in a longer distance rather than those extreme riding activities on track. But that doesn’t mean the French takes safety part of the Speed R lightly, it is in their very nature that Shark helmets wants to be the safest helmet that is available on the market out there. Our rider was fortunate to be able to use the helmet on his professional work and also his personal riding on a day to day basis. Like what we previously state, a helmet can only be truly tested when it gets into an accident or crash during a riding session. Our rider was unlucky to be in that position when he was testing an Aprilia machine in Sepang circuit back in 2014; where he was confronted with an unfortunate situation of crashing onto another bike while he was on a fast lap. The Speed R that he used took the test when he was flipped over from the bike and hit the ground head first on the left side of the crash helmet. The crash then continues with our rider sliding on his face on the Sepang circuit tarmac which ultimately stops him in the middle of the track. The aftermath of the crash can be clearly viewed from the damage on the helmet which left the Speed R unusable for the rest of 2014. Although the crash which occur around 120km/h-130km/h speed; our rider sustains no head injury and was diagnosed with no severe concussion to the head and that proves that the Speed R was able to withstand such impact of sudden deceleration from the crash. The visor of Shark helmet from what we’ve been told is the thickest in the market as of now, and during our test rider’s nervy crash situation; the visor remained intact without shatter or disassembled from it’s place. This surely comes as a positive point for those who are looking for a true safe proven helmet. We are sure that many other high spec helmet will be able to withstand such impact as well but with the Speed R; we can be sure to say that it is more than capable to be used on the open road. The main safety part that we are looking at is the absorption capability of the helmet during a crash and the Speed R was successfully tested during the crash after what have been a hard year for the helmet through out 2014.This give a positive point for the durability of the helmet and certainly the rigidity of the built itself.